PieGram is currently on hiatus as we get our new cafe SmallPie up and running! We hope to be back sending packages of pie soon! In the meantime, we can send them locally in the City of Milwaukee through our courier service. Please email us at bakeshop@honeypiecafe.com for more info. PieGrams are packages of mini pies made with love in Milwaukee, Wisconsin at Honeypie Cafe. You can customize your PieGram package by choosing any combination of our different flavors. We pack them up and send them on their way with a personal note from you on a hand-crafted card (see below for designs). 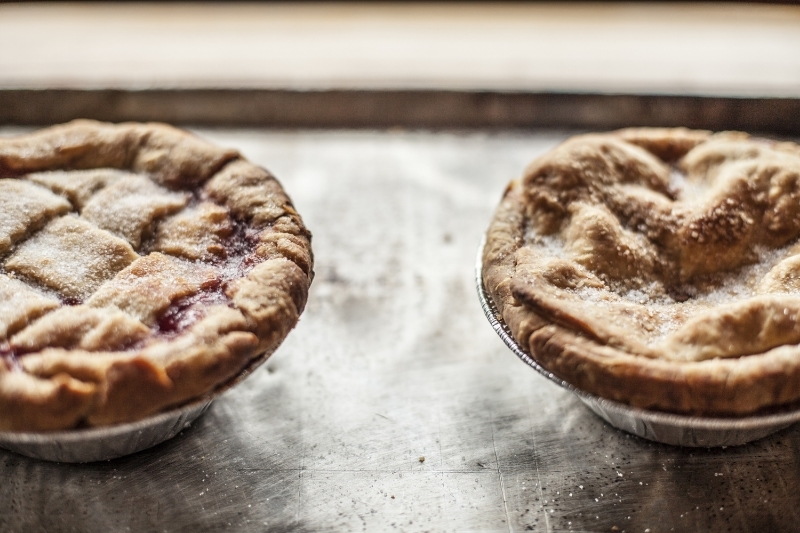 We make our mini pies in small batches, by hand, with locally and regionally sourced ingredients. PieGrams are shipped out on Mondays and Tuesdays* through USPS. We can ship anywhere in the continental U.S. Pies generally arrive 2-4 days from shipment. PieGrams are a spectacular gift for any occasion. Everyone loves pie! And people love it even more when it shows up on their doorstep. You'll be sending pure happiness through the mail. Pies are shipped using USPS and are generally delivered in 2-4 days. We cannot ship to PO Boxes or buildings where packages cannot be left behind without a signature. Since the product is perishable, please be sure your recipient will be in town to receive their package the day it is delivered. Since pies are not returnable, we cannot be responsible for undeliverable pies due to incorrect addresses. PLEASE make sure your recipient's address is correct and can receive packages at the address.